Enduro Engineering is all about protecting your motorcycle, even the parts you may forget about, which is why they’ve made their Lower Left Fork Leg Guard. 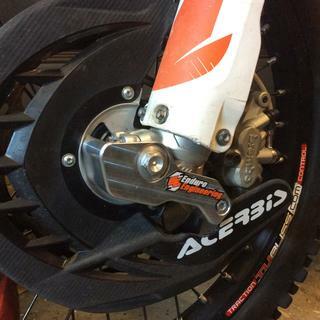 If you decide not to run a front disc guard or have a guard that only covers the caliper, which can leave the fork leg open to damage. And that’s a much more expensive component than a brake rotor. But, Enduro Engineering created this guard so you don’t have to sacrifice that protection. 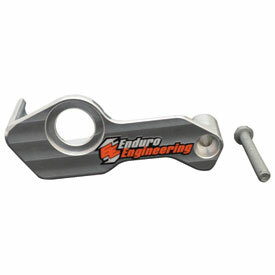 EE makes the billet piece with CNC precision machine from aluminum alloy so it has both strength and a light weight. And they mount the guard using the axle for rigidity and a brake carrier bolt so it won’t rotate out of position. It seems simple but Enduro Engineering does it right by making the guard high quality, as light as possible, and basically indestructible. They even include a through hole used for adjusting your rebound clicker, and the long er than stock bolt you’ll need for mounting. Must have for rocks ! I live in Az and we ride lots of rocks.This has helped keep the bottom of my forks from getting chewed up and more importantly,the axle nut from getting ground up from gnarly terrain ! Easy to install and looks the part. Way cheap insurance against rock-rash on your machine. The product is great. It feels durable and strong. Just a note, if you are using the "acerbis" cover X Brake you need to modify a little bit the brake cover in order to fit it. Also if you using torque wrench to torque the screw of the axle clamp.....nothing fits in there, so you cam adjust them by experience ( feeling ) or you may use a spokes torque wrench. Overall, I definitely suggest this product to all of you, something that you need especially if you ride in rocks, and you don't want to damage your lower fork. Always like Enduro Engineering products. Fits well and easy to install, looks great and good protection! A great item and great proctection against the rocks during. My dualsport race.